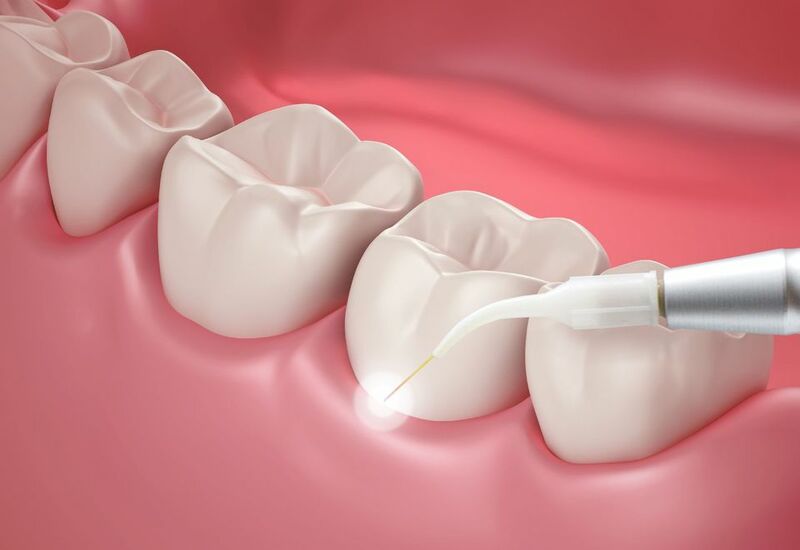 With the introduction of laser technology into the field of dentistry, dentists are now able to perform more precise and efficient treatments with minimal risk of complications. At DeMille MacKay Dental, we offer advanced laser dentistry using a carbon dioxide (CO2) laser. This tool can treat the soft tissue of your gums, inner cheeks, and tongue, as well as the hard tissue of teeth and bones. At our North Salt Lake and West Valley City, UT, dental offices, Drs. Christopher DeMille and David MacKay use laser dentistry to improve the efficacy of procedures like gum contouring and root planing, as well as to treat canker sores and cold sores. A dental laser can be used to sculpt the gums and create a more aesthetically-pleasing frame for teeth. Not only are these tools incredibly precise, but they also sterilize the treatment area. As a result, lasers can minimize the possibility of infection after your procedure. In many cases, our CO2 laser can be used to treat canker sores and cold sores. While some patients believe these types of sores are interchangeable, they have different causes and symptoms. Canker sores appear inside the mouth as small, white ovals. Cold sores, in contrast, form outside of the mouth and often look like pimples. Drs. DeMille and MacKay use laser dentistry to improve the efficacy of procedures like gum contouring and root planing, as well as to treat canker sores and cold sores. CO2 laser therapy can be an extremely effective treatment method for both types of sores. A typical laser treatment is virtually painless and can immediately relieve symptoms such as pain, itching, or burning. The procedure itself lasts only 15 minutes and can dramatically shorten the healing time of sores. It is important to keep in mind that receiving a laser treatment does not mean you will never have cold or canker sores again. However, CO2 laser procedures are shown to extend the length of time between breakouts and in some cases, reduce the risk of recurrence altogether. At DeMille MacKay Dental, we are committed to providing state-of-the-art dental care at an affordable price. Our CO2 laser allows us to provide an extensive range of treatments as comfortably as possible. To find out more about our laser dentistry procedures or the benefits of our other advanced dental technologies, contact our practice online. You can also call us in West Valley City at (801) 969-3025 or in North Salt Lake City at (801) 397-5262 to schedule a consultation today.